"In any case, it is important for me to be good from the Omloop Het Nieuwsblad until the Amstel Gold Race. This year I will not do the Walloon classics, but that does not mean that I won’t go there in the future." Lotto Soudal hopes that 2016 will be another year with great performances from their many Belgian talents. 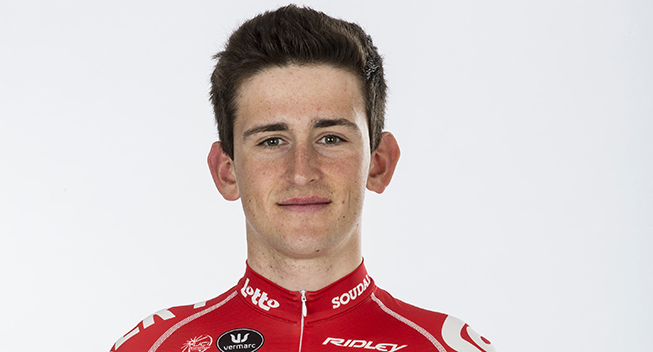 For Tiesj Benoot (21), it is the year of confirmation, but he warns critics beforehand. "It is possible that next season I will be eleventh [in the Tour of Flanders], even with equally good or better condition than this year." Last season Tiesj Benoot came out of nowhere to claim fifth place at the Tour of Flanders at less than 21 years of age. "It will be very difficult to match that performance,” he told Sporza at the team presentation of Lotto Soudal. "Last season I benefited from the fact that I was less known and that allowed me to be fifth.last season ahead because I know less well and could be as fifth. It is possible that next season I will be eleventh [in the Tour of Flanders], even with equally good or better. "In any case, it is important for me to be good from the Omloop Het Nieuwsblad until the Amstel Gold Race. This year I will not do the Walloon classics, but that does not mean that I won’t go there in the future. Due to his good performance, Benoot also gets more media attention. How does he deal with it? "The team has protected me well and all in all I have avoided the worst. I remain calm but maybe I will experience more pressure if the first races are disappointing. Is Benoot the new leader at Lotto Soudal due to his performance in 2015? "No. Last year I was number two behind Jürgen Roelandts and that’s still the case. In that area not much will change. "I also do not see myself as the successor of Tom Boonen and Fabian Cancellara. There are two more generations in between, with riders like Peter Sagan, Greg Van Avermaet, Alexander Kristoff and Sep Vanmarcke. Therefore I do not feel responsible to take over from Tom Boonen in Flanders . " Next year Jürgen Roelandts remains the clear leader at Lotto Soudal in the spring. Last season he was close several times but lacked a major classics victory. "Last season I was always there in thefinale and showed that I was there. "I hope to do that again in 2016. The new approach paid off and last season I did the finale in all five of the cobbled classic, where Ghent-Wevelgem stands out. If I had held on for another 10km, I could perhaps have won that race. "In any case, I have had a good winter season. Last season I was off the bike for eight weeks, this year it was only three. I am now much better than in the same period last year. I have more time to prepare for the classics and that allows me to stay calm. "A classic win is not for everyone. After all there are only five races where you can prove yourself and there are a lot of candidates for the win. As long as I have not won a big race, I will only give myself seven out of ten for my entire career." Last season Tim Wellens had a disappointing debut in the Tour de France and next year he will focus on the Walloon classics and the Giro d’Italia. "I have good memories from the Giro and that race fits better into my program. "First I will do everything to be good in the Walloon classics. For me they are the most important races of the year. I have to maybe be a bit more careful with my statements, because if your predictions are not true, you don’t get much appreciation. You will be judged twice as hard.